Please view more information about our upcoming Mustagh Ata expeditions . We are now accepting applications for the summer of 2011, so please come on out again. It was noticeably colder tonight. Was it clearing? Yes! We got ready at 5:30 a.m. as planned. It was perfectly clear. As we packed up we noticed our usual spark and drive wasn’t there. Spending 2 nights so high slowly drained our strength. We made the decision to descend. By the time we packed everything up it appeared we were in a blizzard. Fortunately we placed bamboo wands, which are garden stakes with colourful ribbons, at periodic intervals for such a situation to mark our descent. Unfortunately, we awoke to heavy clouds and about 20 inches of new snow. The SummitClimb team elected to wait a day and hope for better weather while our companions, Shy and the Mountain Madness team, decided to take a stab at it. They knew they were not likely to make it very far, but hoped to set an altitude record for the 13 year old Alex, which they did by making it to 7000 metres/23,000 feet. Congratulations! We are truly alone on this mountain now -- it's a great feeling! No more groups planned for this season. The Euros have finished and the solo Swedish woman has moved to the other more frequented route. Bill and Kaley set out for camp 2 midmorning followed by Hart's group on skis. A little later Lobsong and Zhasee followed catching up and passing everyone, of course. Lantou, Asu, and I were sweep. All members seem to be in great spirits and really good shape. Even Annouck who was having some minor altitude problems is charging up the hill and reports that she feels fantastic. Pierro sets a great track up amd maintains a slow steady pace. Hart is viewing this a training climb for bigger mountains and is handling the altitude well. Bill and Kaley are enjoying their last night in a tent for 2 as tomorrow I join them at high camp. We try to conserve weight and strength by having only the minimum tents necessary. Wish us well. 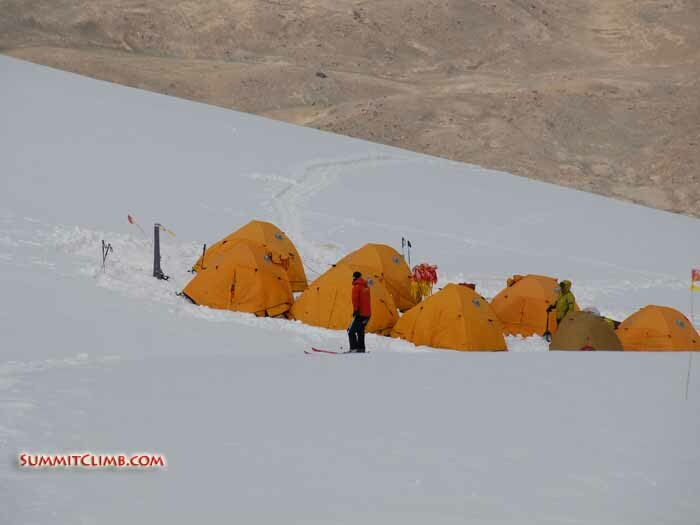 Tomorrow we break new ground up to camp 3 and then beyond! This is Mike Browder calling in with a dispatch for the SummitClimb 2010 Mustagata expedition for the 16th and 17th of July. Yesterday was a tough day climbing to camp 2. This starts with a steep rise right out of camp 1 which continues for a ways. The weather and snow conditions were excellent for using snow shoes, clear skies and not too hot. Bill, Kaley and I made it in roughly 5 hours, which is good time. Today we elected to stay in camp 2 acclimatizing. Skiing down from camp 2. (Photo by Jon Otto). Today we hiked down to base camp for a well deserved rest. Everyone seems to be acclimatizing very well. Life up high is fun but it’s great to be back to the base camp for a more regular diet. Our 3 other members arrived today: Jon Hart, Annouck, and “Pierro” (short for Pierre Oliver). Jon is English and Annouck and Pierro are Swiss. Pierro is a Swiss guide that Jon hires to take him around the globe. What a life, eh?! They are on a different acclimatization schedule than the earlier arriving members, Bill and Kaley but Jon’s team recently climbed Elbrus, one of the Seven Summits, so they should hopefully have some residual acclimatization and be moving up high shortly. Today was a lovely day for coming back to base camp and sunning. The weather promises to be good for the next couple of days. The original 3 intend to head up to Camp I in 2 days and on to Camp II while Jon, Annouck and Pierro will go up to Camp I the same day but returning to base as their initial acclimatization effort. We awoke this morning to more snow and clouds, but now the sun has come out and it’s glorious. All of the members came through the night in fine form. That’s not always the case the first night at this high of altitude. Unfortunately for the rest of the group, Rod has decided that snow shoeing and tent camping is not for him. He has elected to return to Kashgar, then Australia. We all like Rod, so we will miss him. Hello all. Everyone is getting visibly excited as our first test approaches. Tomorrow we go up! Today we have spent time organizing our gigs, altitude quick cook food with each member selecting their favorite foods from out stash. Speaking of food, Rod says that our kitchen is providing the best food he’s had in China. Also today Rod decided to do a wall today nearly to snow line. Bill and Kaley are spending the afternoon going over exactly which stuff they are sending to camp 1 with the local porters. Lots of nitty-gritty, but soon the fun begins! 5330 meters. 17,480 feet. This is our high point today on our acclimatization walk. We could have gone the other hour to camp 1… (lost text). Set an excellent early pace, and later Bill took over. Rod was content to draft and conserve energy for the days ahead. All felt great so hopefully tomorrow we come back up for our first camp away from the luxuries of base camp. This is Mike with Summit Climb again. We are at BC resting and training. Last night Samdian our cook made us a great meal even fresh salad. At the moment we are reviewing how to travel on fixed ropes plus posing up for the glacier. Weather continues to be fantastic. We continue to have beautiful weather here at Karakol Lake, perfect for taking pictures. Today we pack up and will hike the 3 to 4 hours to Base Camp. Looks like a great day for an introductory hike which will start preparing our bodies for the rigors ahead. We’ll be curious to see if there is snow at base camp as from here it looks like the snow line extends somewhat low this year. Most of our support staff went up to Base Camp yesterday bringing up the members ‘and group equipment and getting camp ready. Asu, our sirdar, will accompany us on our hike today, and Lonktu will go with the 3 camels that carry some incidentals to the camp today. Rodney has had it lucky with a tent to himself, while Bill and Kaley sharing a tent have been exchanging snoring stories. But soon at base camp each member will be able to stetch out in their own tent and start organizing their equipment for the coming climb. Our reliable camel transport (Jon Otto). 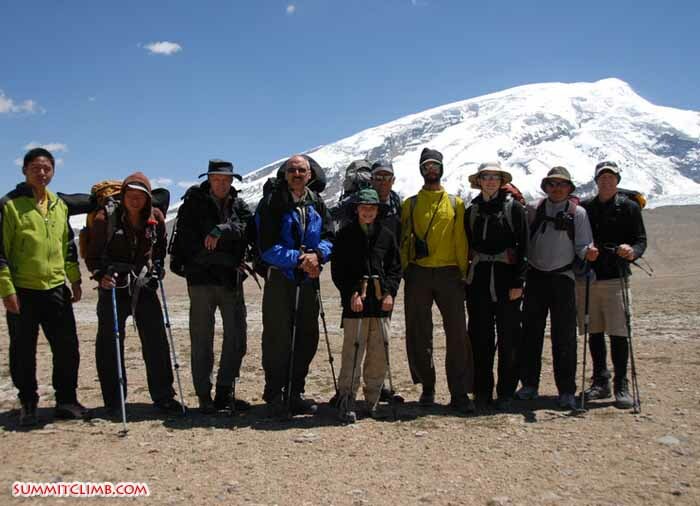 Our acclimatization camp at Karakul Lake (Jon Otto). 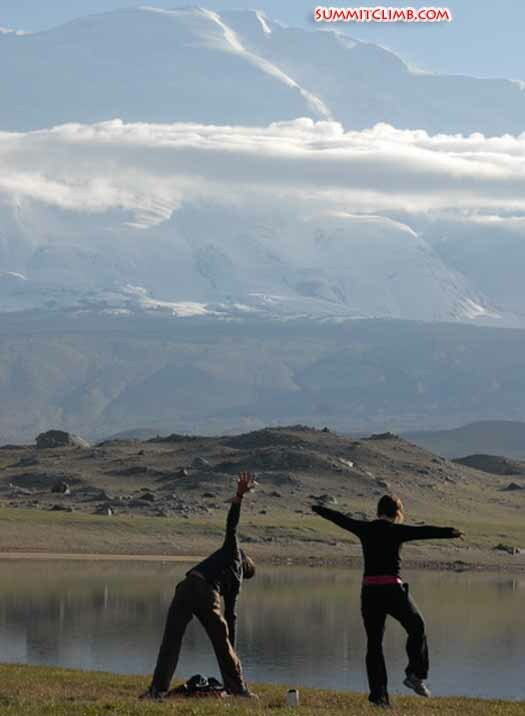 Members doing yoga at Karakul Lake with Mt. Gongar behind them (Jon Otto). 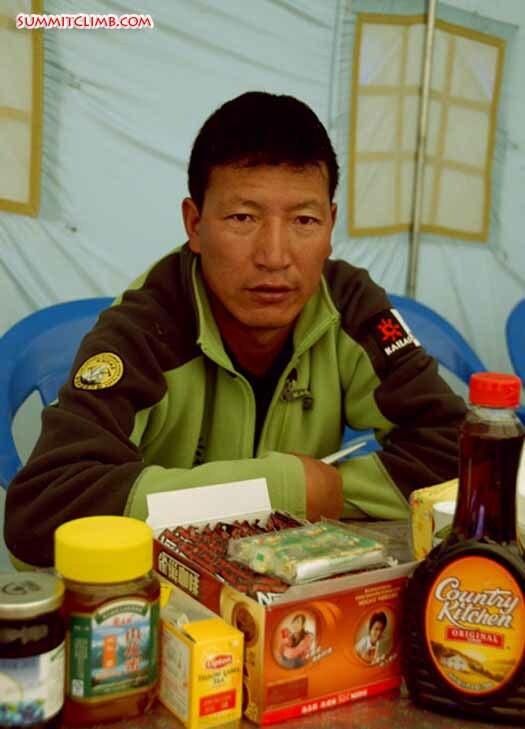 Our awesome basecamp cook, Samdien (Jon Otto). 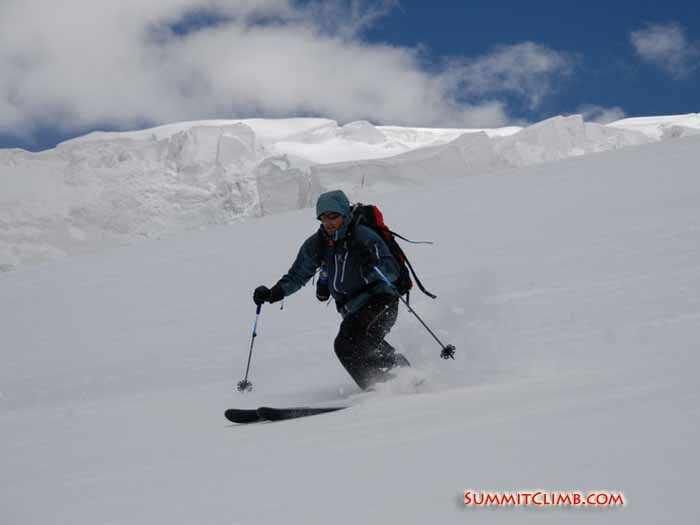 This is Mike Browder of Summit Climb on the 2010 Summit Climb Mustaghata Expedition. Today is the first real day of the expedition. 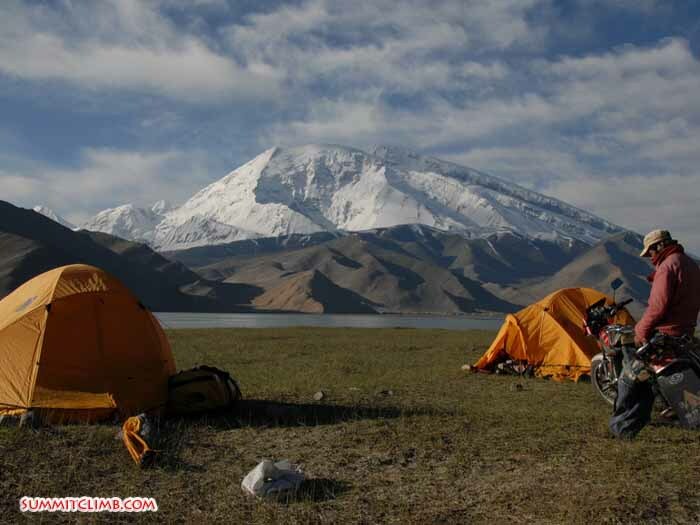 We left the city of Kashgar for beautiful Karakul Lake at the base of the mountain. All members arrived in Kashgar a couple of days ago with no missing baggage or any other major problems fortunately . It’s quite a contrast between the hot desert of Kashgar and the foothills here where we even had a few snowflakes fall during a beautiful sunset. The mountain stretches out in front of us with the route plainly visible and it looks in great shape, very skiable or snowshoeable, and beckoning us upward. 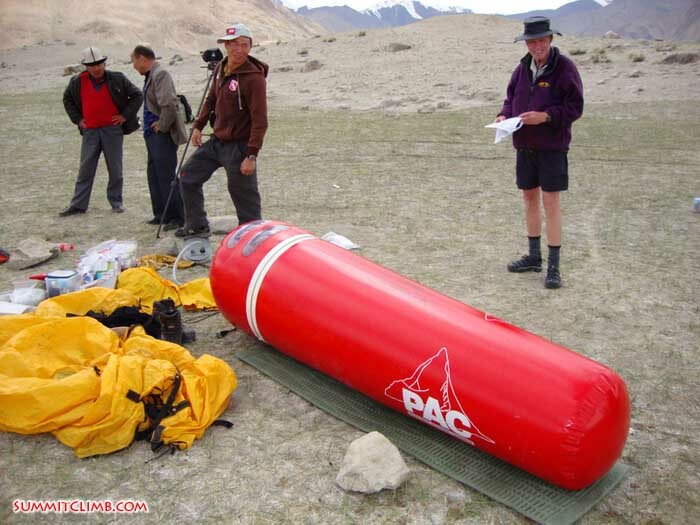 Tonight we get to try out the high altitude tents: Billy and Kaley together of course, and Rodney nearby. Everyone is in great spirits and clearly excited to be so near such a large mountain. 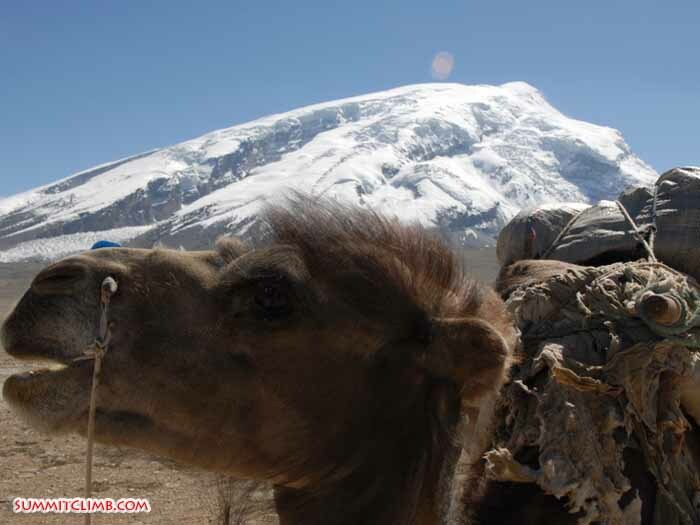 Tomorrow we will start with some medical training (the Gamow bag, and some other things), letting our bodies get used to the altitude here before we ascend higher to base camp on the 7 th. Team photo (Jon Otto). Team learning how to use the Gamow bag (mike Browder).